COM Port Stress Test - Allows to test your serial port performance and stability. For Windows 2000 - Windows 10 (2016) (incl. Server, x86 and x64). Latest version: 1.4.4 build 630. June 30, 2015. 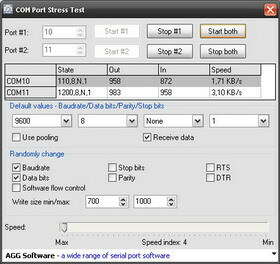 COM Port Stress Test is a tool for testing a COM or RS232 port (device), that generates a serial stream of data with random communication settings. Stress test put a greater emphasis on robustness and error handling under a heavy load, than on what would be considered correct behavior under normal circumstances in your application. The goals of such tests may be to ensure the application doesn't crash in conditions of random data flow. COM Port Stress Test may help developers or experts test their hardware, software and applications with extreme conditions. 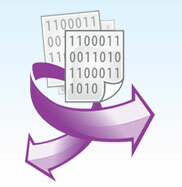 This program can generate a very fast data flow, randomly change baudrate, flow control or RTS and DTR state. What problems can be solved with COM Port Stress Test - Freeware? Our software is ideal for numerous types of applications: software developers, technical Support Staff, application developers. With help of this software you can create a load on a serial port by simulating the activity of a serial port software. Getting started is easy. COM Port Stress Test - Freeware is ready! After installation you may locate a program icon on the desktop or in the Start->Programs menu and launch COM Port Stress Test. Then select COM numbers for one or two ports, default communication parameters, configure test's conditions click the "Start" button. Visualization. The program displays in/out speed and bytes count for both ports.